The Fine Arts Building was opened in 1954 and houses the works of some of New Mexico’s most exceptional artists. The State Fair’s collection is one of the most historic and significant in the state. The goal of EXPO New Mexico is to be recognized as a unique, dynamic, family-oriented and profitable venue for arts, culture and entertainment. EXPO New Mexico is committed to providing nationally recognized event facilities that produce the highest quality annual State Fair and other events throughout the year. EXPO New Mexico is responsible for operating and maintaining, a year-round service-oriented events and entertainment facility and event venues for public use and benefit which help build the infrastructure for the annual New Mexico State Fair, authorized in state statutes NMSA 1978 §§16-6-1 et seq. EXPO New Mexico is charged with creating an annual State Fair experience that reflects and showcases New Mexico’s agriculture, industries, arts, science and technology, the diversity of its people and traditions, and promotes youth development and education for all ages. Karen Yank, from Sandia Park, New Mexico was selected to create the artwork. 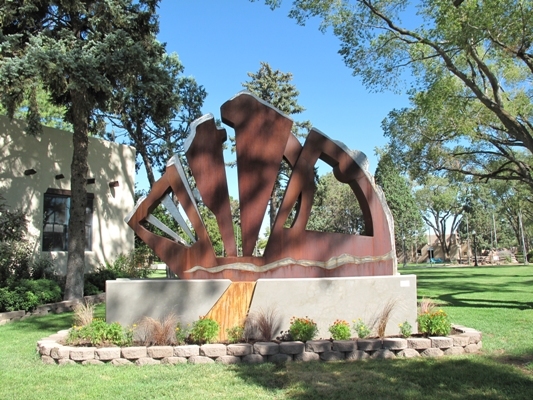 The piece was installed in June 2010.